We're hoping to have a finished manuscript by Christmas. He's told me he has five chapters left and bits of each chapter are done. He really wants it done by the end of the year. We really—I mean really—want to announce the pub date in January. So we are most likely only 5 chapters away from hearing a firm publication date, which is just about the best news we could hope for. There is always a chance Martin may change plans slightly and add another chapter or two, but it is clear the end is in sight. 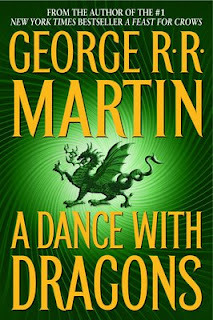 If this all comes together a publication of A Dance with Dragons is likely to happen by October of 2011 if not sooner by 2 or 3 months. It all depends how quickly Spectra will want to get it out. I was still too wiped out to put together a post of my pictures from NYCC so look for that soon. FANTASTIC news. I'm thrilled to hear that the end may be in sight. I just hope there aren't any unforeseen delays. I'd love this book to be out in 2011!! bah, this is meaningless. GRRM has been almost done for 3 years now. Whether it's 5, 10, or 100 chapters to go, it doesn't matter until he turns it in. And I will continue to believe that he won't turn it in until next year (regardless of what year it is) until he actually turns it in. The next battle he will face is what to cut, apparently ADWD is already at the size limit for publishing it as one single volume. @Neth - I've always been the half full kind of guy. Plus with George over coming his biggest admitted hurdle of the so called "Meereenese knot" I think the chances of it being released in 2011 are valid. The one problem I foresee is once it is officially announced people will be complaining The Winds of Winter isn't out yet. truth is that I don't really care. I decided years ago that I have plenty of good books to read to worry about waiting on Martin to finish up. I buy the books, but I'll be waiting until he finishes the series before I read any more (and I'll reread the three that I have read at that time). Neth is right. It's not worth holding your breath for. The Wheel Of Time series will be finished first, and Robert Jordan is dead.Don't get me wrong, I really like the books, but this is too long of a wait. It's starting to remind me of Stephen King's Dark Tower series wait between books 4 and 5. I recently read the first four books and I thought they were totally amazing(Feast for Crows got a bit slow and distracted but still good). Then I found out that book five has been in progress for over 5 years and I got a bit bummed out. At this pace the series won't ever get finished because, I'm sorry to say, he is already getting a little old. What was said was exactly correct. Robert Jordan was able to die and will STILL get out three massive books in less time than it takes Martin to get out one. I was a huge fan of his series from the beginning - still am - but its very hard to get excited when it feels like you're being taken for granted by an author who's dedication to his craft (and his fans) is in question. When/if the new book comes out, I'm sure I'll re-read the series (who can remember what happened 10 years ago?) and catch up, but until then I'll hold off tossing laurels at his feet for 'almost' being finished with a book he said he'd publish four years ago.